I've had a few hens and chicks given to me over the years but they always seem to die. My soil is mostly clay and I know that it's recommended to have them in really well drained soil, so I usually plant them in raised beds. They grow well for a while, like a year or two, but they never seem to get any bigger or produce babies. Often, they flower, most or all of the clump if there are more than a handful. This is the end of them, because they die off after flowering. Other times, the ones I've planted near the house and beside walkways only survive a year. I think it's because of the ice on the paths, which either heaves them out of the ground, or the salt does them in. What am I doing wrong? I love growing hens and chicks, but they don't love growing for me. Good drainage is absolutely essential, as you've noted - especially in winters that get a lot of 'freeze/thaw' cycles. The heaving that occurs when there is even a tiny amount of moisture puddled near the roots can be fatal. So how do you make sure that the drainage is perfect? 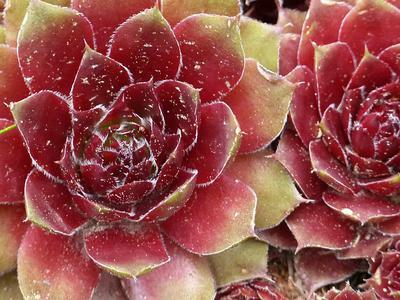 I've had exceptional success growing hens and chicks (Sempervivum) in rock walls. Planting them is easy, just jam the roots into a space between the loosely stacked stones and they find their own way into the soil behind them. Over time, they colonize even quite large areas, so making a tight fit with field stone or other rocks is not necessary. I've even seen a technique where people plant Semps in socks to make a plug type of arrangement to make it easier to stuff into the holes, but I find it just as successful to simply push the root ball into the hole. Let nature do the work for you! Raised beds also work well, and this makes it possible to grow hens and chicks almost anywhere - even beside walkways. The only place that it's nearly impossible to grow them is under eaves or anywhere that gets seasonal moisture. Another trick is to cluster larger rocks together, say three or five together, put some sandy soil mix in between them, and plant the hens and chicks on top. This makes sure that the roots will always stay dry, and allow excess moisture to drain away. As for the flowering, this is impossible to prevent. There will always be a certain percentage of rosettes that will be mature enough to bloom. Maintaining a good amount of young chicks that will grow for two years before blooming helps prevent them all flowering at once. Also, some species and cultivars are more prone to flower than others.